The U.S. Food and Drug Administration (FDA) today released to the public information regarding entry line refusals for the month of August. The agency reported refusing a total of 207 seafood entry lines last month. 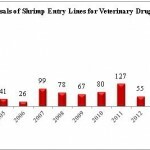 Of these, 72 (35%) were of shrimp entry lines refused for reasons related to banned antibiotics. 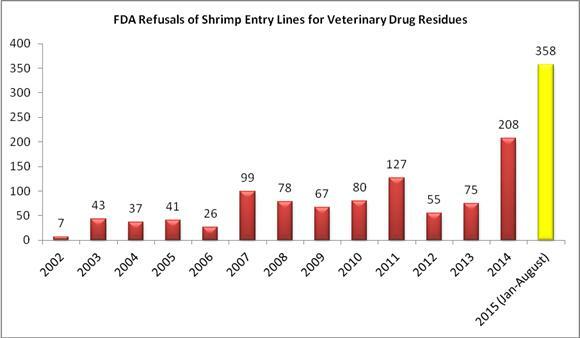 Through last month, the FDA has now refused a total of 358 entry lines of shrimp products for reasons related to banned antibiotics. 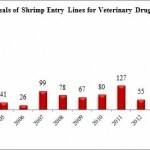 This exceeds the total amount of entry lines of shrimp refused by the FDA for the same reasons over the three previous years (338). Zhanjiang Fuchang Aquatic Products Co Ltd (China), a company not currently exempted from Import Alert 16-131, had one entry line refused for breaded shrimp contaminated with veterinary drug residues in the Los Angeles District. The FDA also recently changed the format of its website reporting of entry line refusals. The new portal (which can be accessed here: http://www.accessdata.fda.gov/scripts/importrefusals/) includes a description of the entry line refusal process. 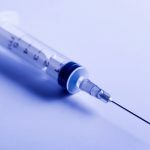 First, the FDA makes a determination to detain a product “that appears to be out of compliance.” Next, the FDA district office issues a “Notice of FDA Action” specifying the nature of the violation to the owner of the shipment or the shipment’s consignee. Once that notice is issued, the owner/consignee is entitled to an informal hearing regarding the FDA’s detention determination. If the owner fails to demonstrate that the imported good is, in fact, in compliance with FDA rules or fails to submit a plan as to how to bring the product in compliance, the agency issues a “Notice of FDA Action” formally refusing admission to the imported goods. Once this notice is issued, the goods must be exported or destroyed within 90 days. The FDA’s reporting of import entry line refusals regards only those products where the administrative process has reached the point of a “Notice of FDA Action” refusing admission. This means that refusal date reported by the agency should generally be later than the date when the goods were attempted to be entered into the U.S. market. The lag time between the arrival date of shrimp imports and the refusal dates reported can sometimes explain why shipments continue to arrive at a port even after an FDA district office has made a finding that exports from a particular company are contaminated with banned antibiotics. This lag time, however, does not explain the continued high volume of refusals of entry lines of shrimp shipped from Malaysia. Nor does it explain the consistent appearance of ostensibly “new” exporters of shrimp from Malaysia. FDA’s reporting of refusals of shrimp shipments from Malaysia is unprecedented and begs the question as to why importers in the United States continue to attempt to source shrimp from these questionable suppliers.